University of Petroleum and Energy Studies (UPES) Dehradun will be conducting UPES Legal Studies Aptitude Test (ULSAT) for the admission year 2017 on May 13. The UPES College of Legal Studies (CoLS) officially announced ULSAT 2017 on November 15, 2016, sharing that ULSAT application forms can be filled till May 3, 2017. Candidates seeking admissions to the law programmes offered by UPES can also do so without applying for ULSAT, through Class 12 Board Merit, CLAT Merit or L-SAT India Merit, as the University has made available 20% seats for this purpose in the BA LLB (Hons. ), BBA LLB (Hons. ), B.Com, LLB (Hons) and B. Tech LLB (Hons.) courses. The candidates applying through the non exam pathway mode will be directly invited for Group Discussion and Interview process subject to their clearing the merit requirements. The last date to apply for UPES law admissions through this mode will be May 30, 2017. 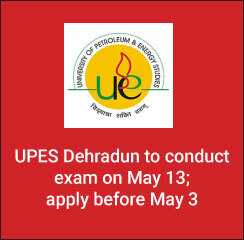 Candidates interested in pursuing undergraduate law programmes from UPES Dehradun can read below the ULSAT official notification and other exam details. Candidates are required to ensure fulfilment of eligibility criteria for ULSAT 2017. Following the ULSAT eligibility, candidates need to have qualified in 12th board examination with a minimum score of 50% marks in aggregate of the subjects and English as a compulsory paper. Moreover, the candidates should also fulfil the age conditions under which they should have born on or after October 1, 1995 to be considered eligible for appearing in ULSAT 2017. The 12th board examination appearing candidates will also be considered eligible to apply for ULSAT 2017 subjected to the fulfilment of minimum marks required in the exam. Candidates will have to register online and generate registration id and password. The candidates will have to use these as login details while applying for ULSAT 2017. Candidates will also have to pay an application fee of Rs. 1850 in either of the modes–online or offline. The ULSAT applications can also be purchased by paying Rs. 1750 at cash counters in the college campus. ULSAT 2017 application form needs to be submitted till May 3, 2017 in online mode only. UPES Dehradun will be conducting an aptitude test for offering admissions into five-year integrated law programmes including BA LLB, BBA LLB and B.Com LLB. The UPES regulated ULSAT 2017 will be an online paper (computer-based test) comprising of as many as 200 questions. The objective-type questions will have multiple-choices as answer options. A candidate needs to click on the option which he deems to be correct for the given question. The questions need to be attempted within a time limit of three hours as USLAT 2017 will commence from 9:30 am at various exam centres in 36 cities of India. Each correct answer will be awarded one mark and no marks will be deducted in case of wrong attempts.